I really liked the formula on the Jesse's Girl satin polish. I applied two coats, then gave it a bit to dry down to it's satin finish. 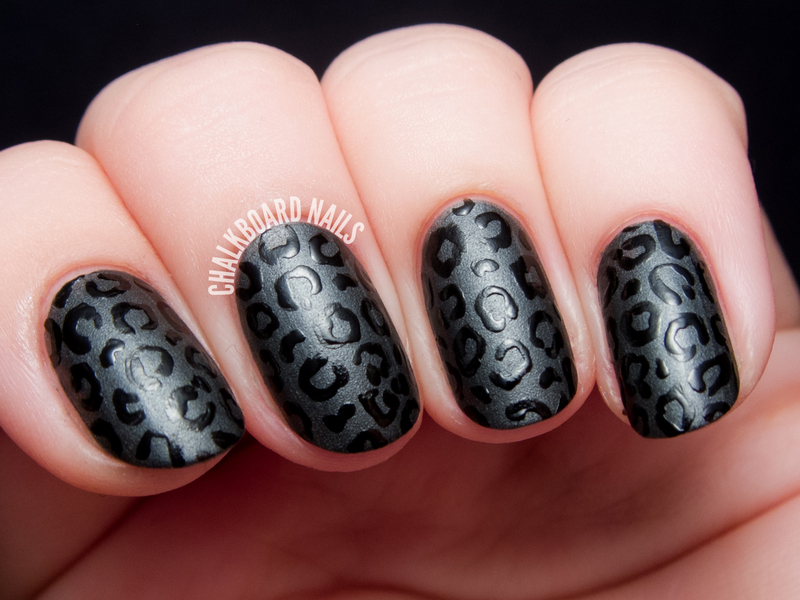 Then, using a small nail art brush, I painted on the leopard pattern freehand. You could also paint your nail art with topcoat for a more subtle effect, but I decided to use black to make the print pop. The final effect is something kind of velvety, with a tiny bit of raised texture coming from the lack of topcoat. I really, really love it. Have you ever tried combining glossy polishes with matte/satin shades? I really should try to do it more often, the effect is totally killer. These look really nice. I've never mixed finishes like this too. The satin vs glossy is a really neat update to the matte vs glossy look. I like it! I'm not a huge fan of leopard print, but even I like this one! Lovely result! I like the contrast between satin and glossy nail polish! I have never tried combining glossy and matte shades. It looks very sophisticated, so I will give it a go in the near future. Glad to hear you enjoyed the results! I think it looks awesome, as cheetah prints go. Yes, they are common but they can also look cool when you try them in different colours. Quicken Spell. A north face outlet online little mean. Demon blood constantly waving his hands in front, the body will appear before a layer of instant color curtains. Available means north face factory outlet not the case. I saw stature flash, and instantly disappeared from the spot. True spiritual nine variants. Is this trick you. The color of blood demon eyes held vigilance, this time definitely not like before the north face outlet the attack so smooth. One hundred and twenty seventh chapter mysterious ice Bagua. Bang bang. the north face outlet north face outlet online It has long been expected that there must guard against the demon blood, so this time he did not close, but at a distance of ten meters at its fast raid while dozens of pale white fingertip north face factory outlet point out spiritual power. Satin polishes are usually more durable than full on matte polishes. To increase wear time though, you can topcoat with regular glossy coat first and then a layer of matte topcoat.